Let’s talk about one of the key concepts here at Interfaithfulness: The More Jewish Jesus. We will be talking about him in this way frequently, but today, I want to do so in interaction with one area of discussion found in the e-book, The Torah’s Goal?, produced by the people at the Israel College of the Bible based project, One for Israel. I call this series “The Torah’s Goalkeeper,” because I believe the Risen Messiah wants to keep people from scoring points against God’s Torah. Let’s deal with what Yeshua said which they say was only provisional, and which they say expired after the inauguration of the New Covenant at the time of Yeshua’s resurrection. In looking at this passage I expect most of you will grasp why I believe in The More Jewish Jesus. For economy’s sake we’ll talk about three concepts. This session we will talk about Yeshua’s teaching in Matthew 23, which they erroneously limit to prior to the New Covenant’s inauguration. Then next time we will look at their comment that the apsotles did not teach us to follow the rabbis. Archaeologisits have found five stone seats facing the congregation where the teacher might teach from have been found in five different locales both in the Land and in the Diaspora. Likely there were many other such seats made of wood which have long since become dust, but these ancient relics remain as mute testimony to the reasonableness of this interpretation. The second option, even though figurative, coalesces with the first. Yes, there was an actual seat, “the Seat of Moses” in synagogues where authorized teachers sat to teach Torah, and one could speak of the Pharisees sitting in Moses’ Seat as a metaphor for this role. All of these usages of the term refer to the authority to teach. The third choice, that the chair was a place where the Torah itself was placed, has its proponents as chairs have been found with holes to hold the wooden rollers of the Torah. However, in the arhaeological examples used to support this theory, these holes are not evenly spaced and the model is underrepresented in the archaeological data. In fact, it is first attested to in the 16th century, and for these reasons is of dubious value. Dr. Rabinowitz views the fourth position to be even less likely, that is, that “’the Seat of Moses’ is a metaphor used by Jesus to describe the Pharisees’ role within the synagogue. . . . ‘their social position as people who control accessibility. They are the ones who know and are able to tell others what Moses said.’” (Mark Powell, “Do and Keep What Moses Says [Matthew 23:2-7], JBL 114 . In his article on this subject, Rabinowitz says that this is implausible because it is “unlikely that Matthew’s messianic community would be completely dependent upon the Pharisees for their access to the Scriptures.” After considering all the possible positions, Rabinowitz says, “We return to our earlier assertion that the Seat of Moses was a physical piece of synagogue furniture upon which authorized teachers of the Torah sat.” And as we said earlier, the parallel and ancient custom found in the Muslim world and in the Roman Catholic world, as well as in university practice make this to be an entirely reasonable and credible likelihood. Yeshua was certainly a great communicator. Are we to assume that it is accidental that he echoes the language of Deut 17:8-11 when he admonishes his disciples to do whatever the Scribes and Pharisees say to do? Are we to assume he was sloppy to be inferring that their authority was legitimate, although their example was not? The authors of TTG insist that “context is king.” I agree. In context, it is irrational to conclude that Yeshua is simply saying “listen to them when they read the Bible to you, otherwise ignore them.” Are we to agree with this interpretation? Is that what we are to imagine here? To do so ignores the intentional intertextuality of Yeshua’s admonition—that he was echoing Dt 17. No, in this Matt 23 context, Yeshua validates Jewish communal structures (do what the Scribes and Pharisees they tell you to do). To assume otherwise because we find this upsetting is to hide our heads in a pile of theological sand. Did Yeshua have criticisms to level at the Scribes and Pharisees? Many! In fact, these very criticisms may be found in Jewish sources of the time! But amidst his scathing criticism, it is most remarkable that he upholds Jewish community structures, Jewish values, and Jewish custom—man made traditions. He is saying, “Look: the Scribes and Pharisees have God given authority which you must respect, values which you should honor and customs you should follow, but they have also set you terrible examples which you must not follow and here are some of them.” He would not need to warn his disciples and the crowd against the Pharisaic excesses and errors if he was recommending severing contact. It was because he was ratifying this continued contact that he issued his warnings. Nothing else really makes sense. One more point by way of dessert. The good people behind TTG, told us, “Yeshua is speaking before the New Covenant is made,” so presumably we need to realize these were mere provisional measures. That’s a weak argument and I will show how weak it is next time when we look at how the Apostles, who learned form Yeshua for forty days after His resurrection, understood things. But before we get to that next time, here’s that dessert. Here he is, after the resurrection, eating matzah because after all, it is still the Passover season. AND, not only that, but the resurrected Messiah does something rabbinic! He makes a b’rakhah! There is NOTHING in the Tanakh about making a b’rakhah before a meal, only after a meal. This is a rabbinic traditiion! Didn’t he get the memo that all of that rabbinic stuff went out as soon as the New Covenant was inaugurated? Here we are with the Messiah making a motzi! I guess he didn’t get the memo. Maybe we should just say, “Old habits die hard.” Actually, old habits came to life again, in the risen Messiah, the Son of David, still living like a Jew. 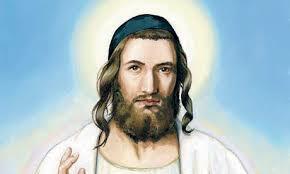 The More Jewish Jesus.